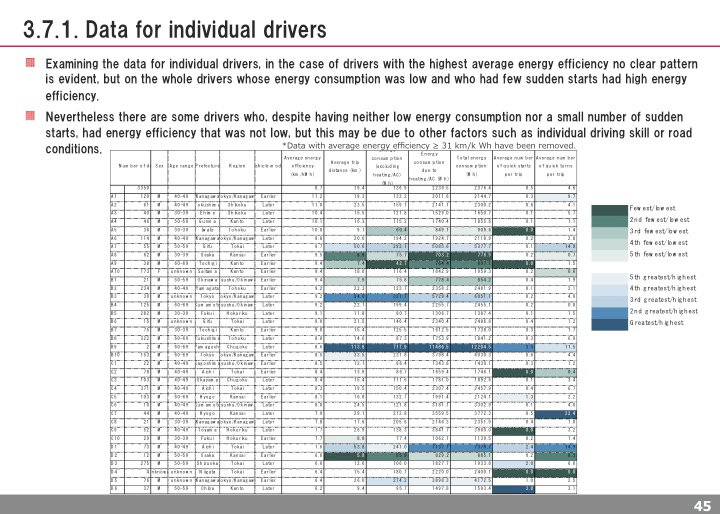 IID announced to the public e-Denpi Report 2014-15, a report compiled with the cooperation of Nissan Leaf owners from throughout Japan enrolled via the car fuel-economy management service e-Nenpi (http://e-nenpi.com) and the largest general automobile news site in Japan, Response (http://response.jp). 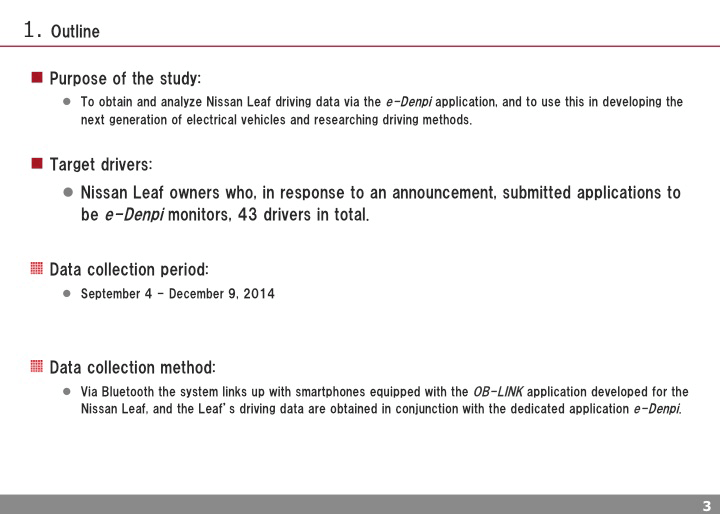 For the e-Denpi study, drivers attached the OBD II cable of their car to a dedicated communications terminal from the Japanese firm HKS Co., Ltd., which in turn is linkable with the smartphone application e-Denpi App. When the smartphone application is on, more than ten different parameters, such as residual battery charge and power recovery ratio, are shown on the screen in real time. After any personal information had been removed, the data was uploaded to the cloud, and the trip data and power-consumption log data were then analyzed to prepare the present report. and registering one’s affiliation and contact information. The next study is planned for September 2015. Data collection method: From a communications terminal attached to the OBD II cable of the car were obtained more than ten real-time driving parameters, such as residual battery charge and power recovery ratio, as well as electrical-current log information. 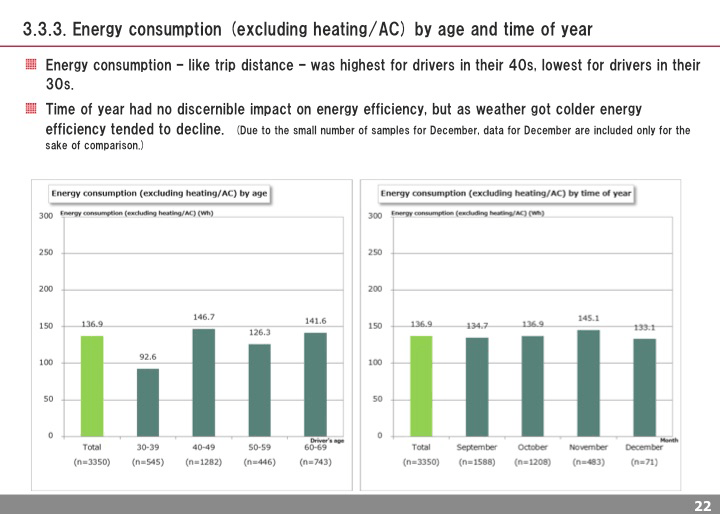 Comparing earlier models to later models, the power consumption of earlier models was higher. When it came to achieving the car’s rated range, i.e., the distance that can be driven on a full charge, earlier models averaged 107.8% of the rated range, while later models were also high at 89.6%. 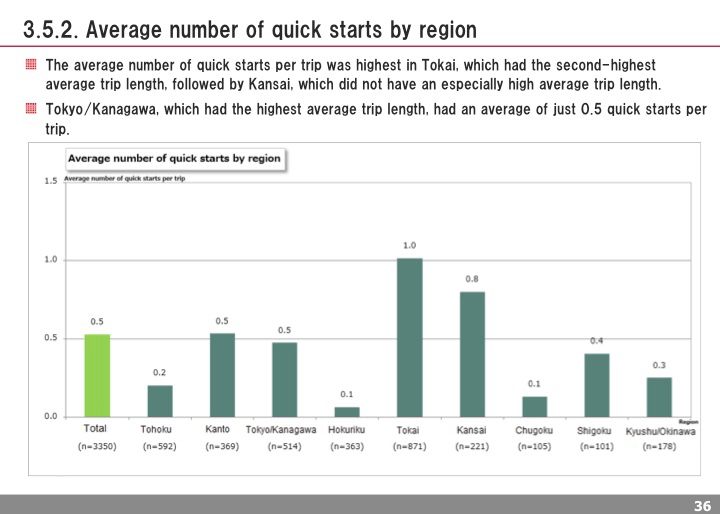 Breaking down the results by region, the power consumption rate was seen to be lowest in Shikoku, highest in Tokai. 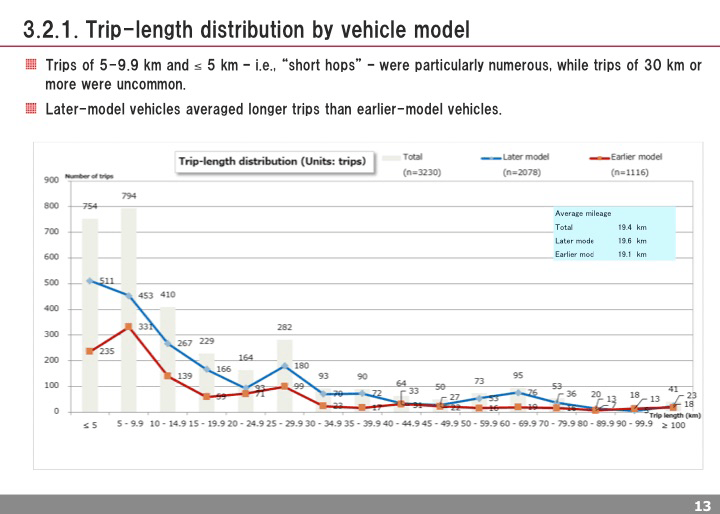 By age, the consumption rate was lowest for drivers in its 30s, highest for those in their 50s. By time of year, the consumption rate was lowest in September, highest in December. 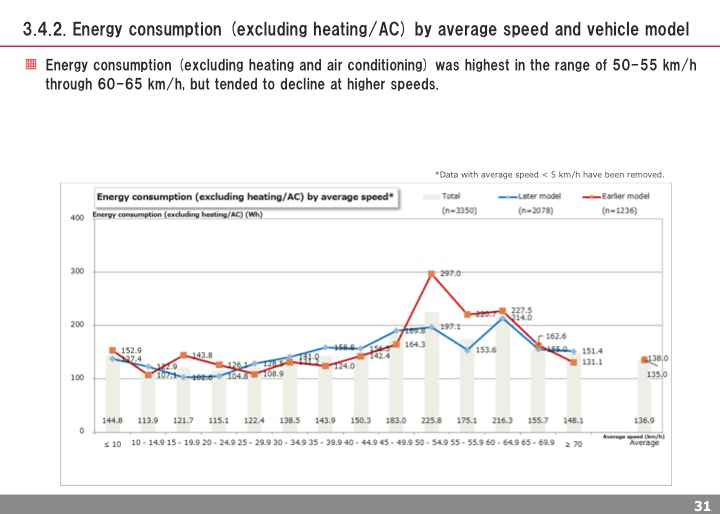 Average power consumption was highest in the case of average vehicle speeds below 10 km/h and lowest for average speeds in the range of 35-40 km/h, with the rate of consumption rising again at higher speeds. A greater number of sudden starts led to higher power consumption. e-Nenpi is a service that permits drivers to register from their mobile or smartphone and enjoy managing their car online economically and ecologically. 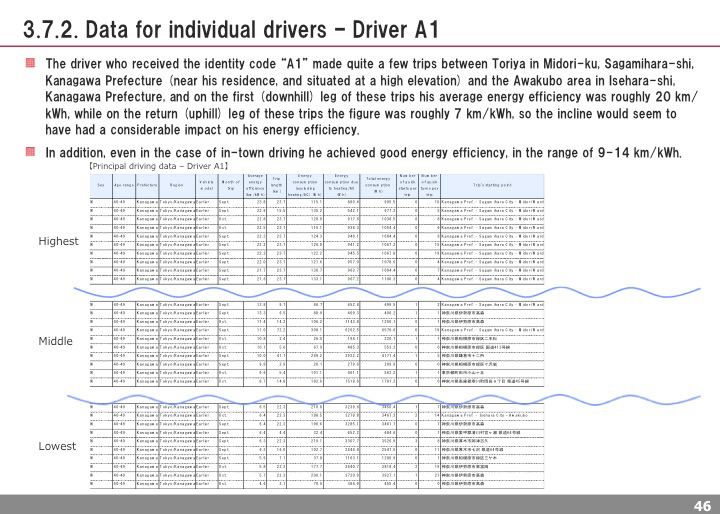 The service provides a wide variety of content, such as calculation of actual fuel consumption, information on gas stations throughout Japan, and reviews by users. e-Nenpi also provides a search engine for EV charging stations and hosts a public database of hydrogen stations for fuel-cell vehicles throughout Japan. e-Nenpi is dedicated to supporting environmentally friendly driving. Masayoshi Ishihara, e-Nenpi Service G, IID, Inc.
Honami Watanabe, PR Officer, IID, Inc.